If you are buying a car, you are likely considering a number of variables in your purchase in order to meet your needs. The size, power, luxury level, options, and fuel economy are probably all factors in your decision. You may need a compact just to run around town or you may need a large capacity SUV capable of towing a heavy load. These two vehicles will surely differ in price and in categories of performance with fuel economy being one of those categories. On a new car, the fuel economy is posted on the window sticker. On a used car, you rely on the dealer to provide you with reasonably accurate MPG rates. Now think of buying (or selling) a house. You make similar choices based on your needs. Size, location, amenities, and probably what the utility costs will be. That is where The Home Energy Score Report comes in. The Home Energy Score (HES) provides you a snapshot of the estimated energy efficiency of the home in a similar way the MPG sticker lets you know the fuel economy of a car. The Home Energy Score will provide you with some baseline information about the homes energy efficiency and other valuable information. Will the energy efficiency of the home be the primary factor in your decision making? Probably not, but the HES will give you an idea of what can be improved in the home to increase your comfort and reduce your energy consumption. What is a Home Energy Score Report? Chris with Inspectek West explains how to read and understand the report. · Providing homeowners and homebuyers knowledge of home energy efficiency and cost-effective improvements in order to reduce energy use and costs. · Encouraging use of reliable, consistent home energy efficiency information in real estate transactions to inform decisions, and build a market value for comfortable, energy efficient homes. The HES is primarily an asset based rating of a home’s efficiency. An asset rating seeks to quantify the energy efficiency of a building based solely upon the inherent components of the house. The DOE model captures data on insulation levels and the heating equipment efficiencies, but does not take into account thermostat settings, appliances, or plug loads because the energy used to operate these components can vary widely depending on occupant behavior. 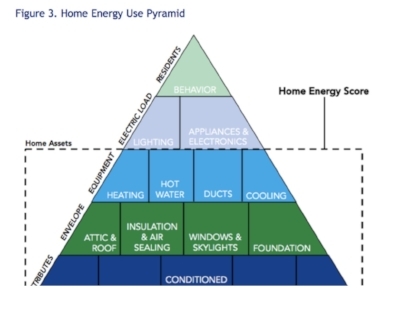 The way the Scoring Tool defines “home assets” for Home Energy Score is displayed in the Home Energy Pyramid. An asset score allows homes to be compared an “apples to apples” basis because it compares houses to one another based on their assets and not how occupants operate the houses. The Home Energy Scoring Tool assesses the effect of changes in a home’s assets, while the occupant-dependent factors and behaviors are assumed to be somewhat constant. An individualized list of recommended energy retrofit improvements that are estimated to payback in ten years or less. The City of Portland has partnered with the U.S. Department of Energy to use the Home Energy Score model and software as the official scoring system for the City of Portland. The Portland HES is slightly different from the standard USDOE report. This custom report uses the City of Portland average utility rates as opposed to statewide averages. Once completed by the Licensed Assessor the report is posted to the Green Building Registry where it is accessible to interested parties., The Home Energy Report should be made easily available to potential home buyers. It should be included in any listing or advertising. Include the score in any online postings. If an upload is possible, include the full report. If not, include a link to the report from the Green Building Registry. In either case, place hard copy print-outs of the report in a location in the house where buyers will see it. Inspectek West provides unbiased inspection services for home owners, buyers, and sellers. We don’t provide remodeling or construction services and our assessment is objective and uncomplicated by the need to upsell home improvement services. With Inspectek West you get the benefit of a professionally licensed Home Inspection company with 25 years of service and an impeccable record of customer service and performance. All of our inspectors are licensed in their areas of practice and work as a team to ensure that our customers receive the very best service. Scheduling a Home Energy Score Assessment can be done on our website, by phone, or by email. We ask that you clear access to the attic, basement, and or crawlspace. The homes mechanical systems (furnace, water heater, air conditioner, etc.) should be accessible and free of obstructions. 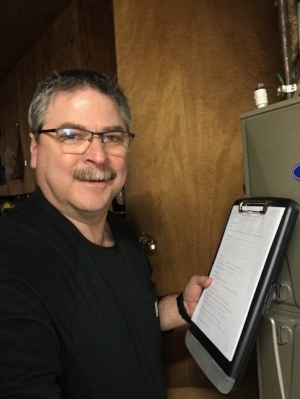 Unlike a home inspection, we prefer that you be home during the inspection to provide us with any information you have on your homes insulation, air seal, modifications, and documentation for any energy improvements to the home.